Matt Casey has joined Gosport Borough on loan. The Pompey defender goes straight into Craig McAllister’s squad for Saturday’s FA Cup first-qualifying round tie at Sittingbourne. 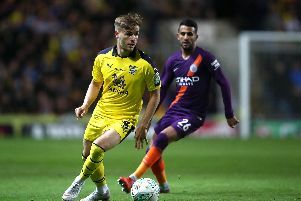 Casey, 18, was at Weymouth on a temporary basis earlier this season but returned to Fratton Park after making just two appearances. The Botley centre-back has now linked up with Borough on a youth loan. It means the Blues have the option to recall Casey when he is required.